To add a user extension, click on the [New User...] button at the top of the All Extensions page. Fill in the required information, as shown in the example below. The PIN is a numeric password unique to the new extension. This number must be a minimum of four (4) digits and may be changed by the new user in the future. The Extension is a 2-digit (3- or 4-digit) number, used for convenient identification and dialing of the new extension within your system. An account cannot have duplicate extension numbers. Each must be unique to your account. Check the User is an administrator? box if you wish for the new user to be able to manage the entire account also. This will give him/her the ability to manage and add extensions, change routing on the Auto Attendant, and view or change billing information. 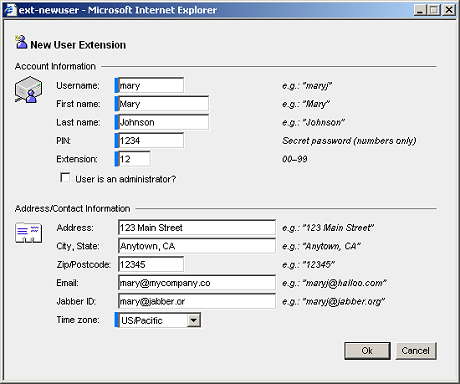 Entering the user email or IM address in the Email and Jabber ID fields will set up the user to use features such as IM Call Notification. In order to finish setting this up, check the checkbox titled “Send IM notice for incoming calls” in the User Settings > Forwarding tab of your My Halloo Extension. For further information on setting up a Jabber Instant Message client, refer to the Support section entitled IM Notification. Finally, select the correct time zone for the new user. This will insure that when he/she signs in, all timestamps for voicemail messages or call detail records will be accurate. After you create the extension, you may wish to request a separate new toll-free telephone number so that callers may reach the extension directly. Otherwise, callers may reach the extension through your auto attendants.